One of the quickest ways to sabotage your success is to come across as a snake-oil salesman. You know just what I’m talking about: the person who has an oily, slimy manner to go with their oily, slimy product. Some people come by this sales style naturally. If you’re not one of them, don’t worry: Here are five quick and easy ways to slime with the best of them. Snake-Oil Tip #1: Promise that your service or product can solve all problems faced by all prospects. Truth in advertising is for wimps. People will believe what they want to believe, so why not say what they want to hear? There’s no reason to limit your market when you have the chance to be the panacea for whatever ails anybody. Snake-Oil Tip #2: Push. PUSH. PUSH! Snake-Oil Tip #3: Imply the buyer is a fool not to purchase your product. People’s egos are often fragile things. One of the most effective ways to…encourage a potential buyer is to imply that NOT buying your product or service is a sign of foolishness. To protect their egos, a goodly number of people will purchase your product even if their guts are telling them not to. And if they’re so foolish as to verbalize their concerns, you’ll be well prepared to handle them with Tip #4. Snake-Oil Tip #4: Gloss over all of the buyer’s concerns. After all, you’re the expert in your field, right? And your product solves all problems for all people, right? So any concerns the buyer has are meaningless. How much more obvious could that be? Snake-Oil Tip #5: Never, never, never ask buyers how well the product worked. In fact, disappear as soon as you have their money; that way there’s no chance of ever getting their feedback. The true snake-oil salesman knows that his product offers nothing but pretty packaging. Thus, all his empty promises will be revealed for what they are as soon as the buyer tries the product. When you emulate the snake-oil masters and focus on making a one-time sale (and hang the long-term consequences), making yourself scarce is the smart—and safe—thing to do. These simple steps will help you join the ranks of the snakiest of snake-oil salesmen. If you’re looking for a bigger challenge, however, you can apply the following anti-snake strategies to build your reputation as a creative, ethical, problem-solving super-star. Success = authenticity + integrity + accountability + value. Strategy #1: Be crystal-clear on what you can and cannot do for your clients, and promote only those capabilities. You may very well be able to help a broad spectrum of people, but who do you do your best work with? Who do you most enjoy working with? These are the people on whom to focus your marketing efforts. Why? Because that way both you and the client stand to gain more than either of you would if you settled for working with less-than-ideal clients. Once you’ve done this, concentrate on promoting and providing only those services which draw on your most highly developed skills. When you do so, you build not only trust, but raving fans, too. Strategy #2: State the benefits of working with you so clearly that your ideal prospects are almost irresistibly pulled toward your message—and you. Your goal is to create a V-8 moment for your ideal prospect, in which she metaphorically slaps her forehead and exclaims, “She’s talking about me. This is the person I’ve been waiting for to help me solve my problem!” You’re not trying to persuade or convince her of anything; you’re simply making it easy for her to see that her problems and your solutions are a match made in heaven. Strategy #3: Make it clear that you understand and respect the prospect, her situation, and her needs. If you make it clear when talking to your prospects that “selling” them something is NOT your goal, you enable them to relax enough to hear your message without raising their defensive shields. They’ll be far more willing to believe that, if the two of you are a poor fit, you’ll say so before wishing them well and sending them on their way. This relaxation and confidence on the part of the prospect allows both of you to forget about jockeying for position in a sales transaction, and, instead, explore problem-solving possibilities through an authentic dialogue. Strategy #4: As much as possible, pre-empt your prospect’s concerns through your marketing communications. After a time, you’ll know what might make your prospects hesitate to commit to working with you. Their concerns may focus on money, process, outcomes, or something else. Knowing in advance what your prospect might perceive as risky will enable you to address these concerns during your conversation. This is a much higher-level version of “handling objections” than the back-and-forth, argument-and-counter-argument process where the prospect says, “But XYZ concerns me” and you say “Yes, but…” and she says “But ABC concerns me” and you say “Yes, but…”…. Strategy #5: Commit to developing long-term, mutually beneficial relationships. One-shot transactions may bring in money, but long-term, win/win relationships create ongoing success. Although it may sometimes be tempting to rely on the more easily developed snake-oil-salesman skills, it’s certainly more profitable and satisfying in the long run to master the non-snaky skills. They’re the ones that allow you to comfortably and confidently charge an appropriate price for the way you make life better (easier, less stressful, more profitable, more fun….) for your clients. If you’re committed to that authentic, value-driven route but sometimes feel paralyzed about how to actually create it, maybe a get-acquainted call between us is in order. My specialty is breaking entrepreneurs free of that “What do I do next?” sense of overwhelm and paralysis. As we develop baby-step action plans and create an accountability system to ensure those steps get done, they leave behind their deer-in-the-headlight stress and replace it with a sense of confidence, clarity, and excitement. There’s no telling right now if you and would make a great team or not, but wouldn’t it be interesting to find out? There’s an easy way to do it: Call me at 319-270-1214 (U.S.) or e-mail me to arrange a nobody’s-committed-to-nothin’ call where we can explore what you need and what I offer. Whether we conclude we’re a fit, not a fit, or not a fit right now, we’ll both be confident we came to the right conclusion. 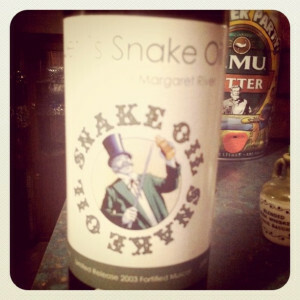 BTW, thank to Graham Hills for posting his snake-oil image in the Creative Commons section of Flickr. This entry was posted in business development, effectiveness, professional skills and tagged authenticity, choice, confidence, effectiveness, sales. Bookmark the permalink. This is a funny way to get your point across about what isn’t good practice, Kathleen. Making people feel unheard or pushed into a sale is a sure way to make it the last time they will buy from you, for sure. I am glad you posted the better choices, too. I really liked how you laid out Strategy #5, and that you mentioned relationships as being mutually beneficial. I think sometimes that is forgotten. Kathleen, I love this: Success = authenticity + integrity + accountability + value. I’m going to use it as a quote for my BNI group! 🙂 Nicely presented. Oh BNI and LeTip… Snake oil at its best! I love your ways of flipping the conversations for us!! So glad you liked the “flips”, Kelly. As for BNI and LeTip, I’m going to go out on a limb and risk being accused of rampant sexism: I wonder if your discomfort with these leads-passing groups has to do with the fact that both were founded by men? While it’s obviously inappropriate to make any sweeping generalizations like “Women are more authentic networkers than men,” I do think it’s fair to say that we approach the networking/sales/marketing processes differently. Any comments or observations? I’m always worried about being the ‘snake-oil salesman’, but it’s good to know that as long as everything is done in integrity and authenticity (which happens to feel really good too!) then success is much easier!